The Duchess of Gloucester, wife of a cousin of the British monarch, has a jewelry collection that outshines those of some entire royal families. Many of her pieces came from Queen Mary via the current duke's mother, Princess Alice. But today’s tiara, the Cartier Indian, arrived in the Gloucester collection from a different, lesser-known branch of Queen Victoria’s family tree. The tiara was originally owned by Victoria’s granddaughter, Princess Marie Louise, who was born a princess of Schleswig-Holstein. Marie Louise’s parents were Prince Christian of Schleswig-Holstein and Princess Helena of the United Kingdom, one of the daughters of Queen Victoria and Prince Albert. Marie Louise had a rather complicated marital situation; she was married to Prince Aribert of Anhalt, but the match was a poor one. The reasons why are debated — many think that Aribert was gay — but whatever the problems were, Marie Louise’s father-in-law, the Duke of Anhalt, apparently decided that he should use his ducal prerogative to annul the marriage while Marie Louise was on an official visit to Canada. Not exactly the tidiest of endings. 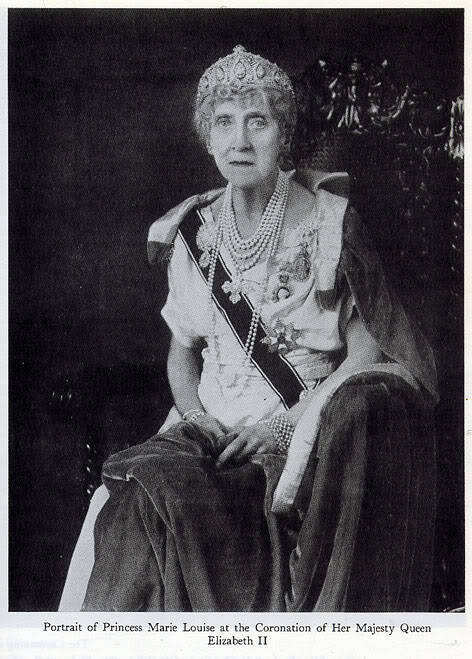 While Marie Louise lost her spouse, she did maintain a rather stupendous collection of jewels, even after her marriage ended and her birth title was stripped (this was in 1917, during the great culling of German titles among the Windsor clan; unlike others who took wholly new titles, the territorial distinction was simply removed from Marie Louise’s). Perhaps the most impressive tiara in the princess’s collection was this pearl, diamond, and sapphire sparkler, which was made for her by Henri Lavabre at Cartier. It was constructed in the early years of the twentieth century, perhaps in the years following the annulment of her marriage; Lavabre's tenure at Cartier dates the piece from between 1906-1921. The tiara is called the “Indian” tiara not because of any specific connection to that nation but because it mimics traditional Indian design motifs. Marie Louise wore the tiara at major royal events, including the 1953 coronation. After her death in 1956, Marie Louise’s tiara was inherited by her godson, Prince Richard of Gloucester, who eventually (and unexpectedly) inherited his father’s ducal title. Today, it is worn by Richard’s wife, Birgitte, who occasionally brings out the piece at state banquets or at the Guildhall banquets which traditionally make up a part of a state visit to the United Kingdom. It was also "worn" by the Gloucesters' younger daughter, Lady Rose, in a 1981 Norman Parkinson portrait.